ABC ISSUE 369 – OUT NOW! Bus-ting for the new ABC edition? It's out now! It’s 3.00AM in the morning, the magazine’s on deadline, I’m already sleep deprived this week to get the issue out the door with the team, and this here editorial is the last thing I have to write. A model from a brand that probably won’t reach our shores, nor get anywhere near mass public transit use locally even if it did – unless there’s the highly improbable chance that regulations change. Not only does it, or something like it, play a key role in maximising and expanding upon increasing year-on-year Australasian tourism statistics, but it illustrates the evolution of certain potentially life-saving and injury-avoiding safety technologies that is hard to ignore should be on every bus or coach, in my humble opinion. Its ability to warn drivers of impending collision in front – or to its side – with another vehicle or hapless human via a series of incrementally urgent flashes of lights and beeps and whistles etc., is underwritten by one crucial talent: to ultimately employ the brakes itself in the event the driver fails to do so. It is a remarkable capability and, encouragingly for the longevity of the role of a bus driver (let’s address that elephant in the room now) – and I mean someone actually steering a bus and not just sitting back on an autonomous one who may well just end up spending most of their time playing Tic-Tac-Toe or making coffees for passengers 30 years from now – it credibly prolongs the viability of their jobs in the global bus industry for decades. What’s on this latest Setra is like having a second pair of eyes, a sixth sense, and/or is a wingman for the driver. A night out on the town with him, he’s got your back! With the mag virtually at the printers, I have to admit in my near-catatonic state I did start to think maybe my paranoia was getting the better of me and that perhaps the issue of pedestrian-to-bus-related incidents wasn’t as bad or as commonplace as I had thought it was. That the tragic death I referred to in Sydney about six months ago was more an Uber-related issue than inadequacies in the ‘bus system’. Hmmm. With bleary eyes I read right now that less than 24 hours earlier a Sydney bus driver has been charged after running over a pedestrian. According to a NSW Police statement, "Police were told the man was attempting to cross the road when he was struck." The NineNews.com.au report continues that the 25-year-old male pedestrian was treated at the scene by paramedics and taken to hospital with serious head injuries and suffering from neck pain. He remains in a serious condition. In instances like this it’s often never clear cut who may have been at fault, but if we can’t have buses stopping themselves when needed then we sure as heck need them buzzing and beeping and all sort of stuff happening if it means it aids the driver to avert such impacts through their corrective nanosecond actions and decisions – full stop. Retrofit it, whatever. It needs to be sorted. Have no fear! It can happen anywhere. In any city or town. At any time. We just need to be ready for such as best possible, with whatever reliable and useful technology we have. Indeed, it’s time to start Googling what’s out there. In this issue of ABC magazine we have some solid news reports for you affecting our industry locally, internationally and … for all we know, spiritually. The protest against the Melbourne Metro Bus contracts got underway on the steps of the Victorian Parliament House recently, gathering 200-odd busies keen to voice their concern, while VW and Hino have entered into a massive strategic partnership – big news! Though my German is a little rusty, my sources within them direct from overseas allude to very exciting times ahead. Now, Volgren’s doing some great things as of late, investing back into its Brisbane outlet with more staff to meet local bus-building demand, plus taking out the 2018 NSW Supplier of the Year Award at the recent BusNSW Members Conference. Nice! Speaking of which, we bring you all the highlights from that great event held at the Hunter Valley, which covered a range of hot topics like on-demand bus services, autonomous vehicles and where we are headed. And, at one point, we were talking about workplace safety and ...Van Halen? True story. It was so intense I was expecting Eddy Van Halen and David Lee Roth themselves to pop out from somewhere and start rocking out on the mini-stage in cardboard cut-out bus costumes. Yep, don’t let anyone ever tell ya ‘we’ bus people aren’t cool. Just say ‘Van Halen, baby!’ – and walk away. In terms of driving, Paul Aldridge is in his childhood element testing a way-cool, old-school Mercedes-Benz O305 out in the wet while visiting the lovely folk at the iconic Sydney Bus Museum, recently. 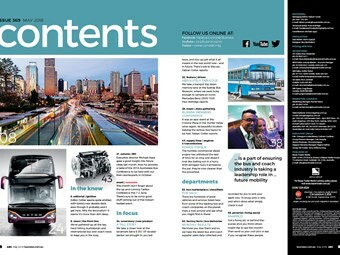 Plus we sus out the latest diesel and driveline happenings in our Engines and Transmissions Guide – which we leisurely put together over weeks and weeks of free time while sipping teas casually with our little pinky fingers pitchforked up and everything. Not! Finally, don’t forget to check out our world-famous Classifieds section, and our legendary website www.busnews.com.au and, if you are lucky, you might just snag a cheeky peek at yourself on our backpage pictorial this month. Other than that, trust me, I’m off to bed. Until the next thrilling instalment.